Need a little something to spice up your vehicles interior? Check out the FanMats NCAA steering wheel covers to add some flare to your ride while supporting your favorite team. Adding a personal touch to your ride has never been easier or more affordable. Made of mesh fabric and faux suede to ensure it will last. They also protect against daily wear and tear to your steering wheel. The logo and team name are embroidered to give you the highest quality. 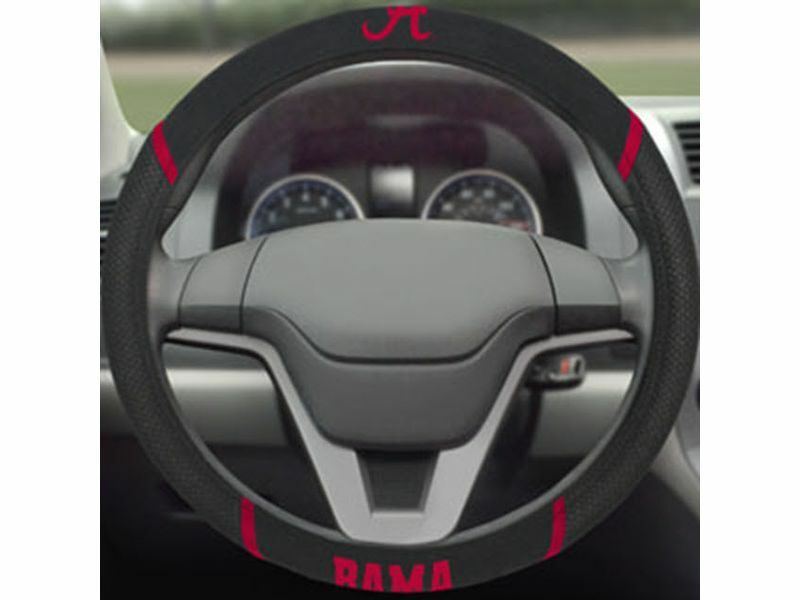 You can easily install these steering wheel covers in no time and easily remover. All you have to do is slip it onto your steering wheel and you're good to go. If you're looking for a way to customize your vehicle at an affordable price, you need to get your NCAA steering wheel cover. Represent your favorite team today! If you have any questions please give us a call at 877-216-5446, and our friendly customer service would love to help you out. FanMats offers a 30 day warranty on the NCAA steering wheel covers. If you have additional information please give us a call at 877-216-5446. Easily install your FanMats NCAA steering wheel covers in just minutes. Simply slip onto your steering wheel and your good to go.